Cameroon Anglophone Region a No-Go-Zone? Women protest, holding up a poster with images of atrocities committed in an ongoing conflict between government forces and armed separatists, in Bamenda, Cameroon, Sept. 7, 2018. 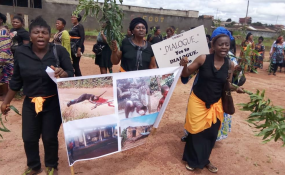 Yaounde — HUMAN rights groups have condemned the issuing of travel restrictions by government in the English-speaking volatile regions of Cameroon. The administration of President Paul Biya, through its regional delegate of transport in the Northwest region, effected the restrictions in the wake of protests against alleged marginalization by the regime dominated by French speakers. Hundreds of people have been killed during clashes with security forces. Over 160 members of the military have reportedly been as separatists intensify their campaign for the region's independence. The Center for Human Rights and Democracy in Africa (CHRDA), bemoaned the restrictions by government as a violation of Cameroon's constitution as well as contravention of international humanitarian and human rights laws. "This policy amounts to nothing less than a xenophobic and counterproductive action by the government and it should be repealed immediately," Felix Agbor Anyior Nkongho, CHRDA founder and chairman, stated. "We implore President Paul Biya, and those around him, to consider the ramifications of the travel restrictions on Anglophones," Nkongho added. English speakers constitute 20 percent of Cameroon's 24 million-population. Amnesty International, another human rights group, has warned the violence in the Northwest could scuttle polls set for next month. Biya, in power since 1982, is seeking re-election.